The Wind Speed Sensor 2740 consists of a three cup rotor on top of an aluminium housing. The sensor can be fi tted directly onto the Sensor Cross Arms 3415/3435 of an Aanderaa automatic weather station or used separately if a connecting cable is used. The sensor foot will fi t onto a 25 mm vertical tube. sensed by a magneto inductive switch located inside the housing. A micro controller reads the pulses from the magneto inductive switch sensing the rotor's rotation and uses the pulse count to calculate the wind speed. 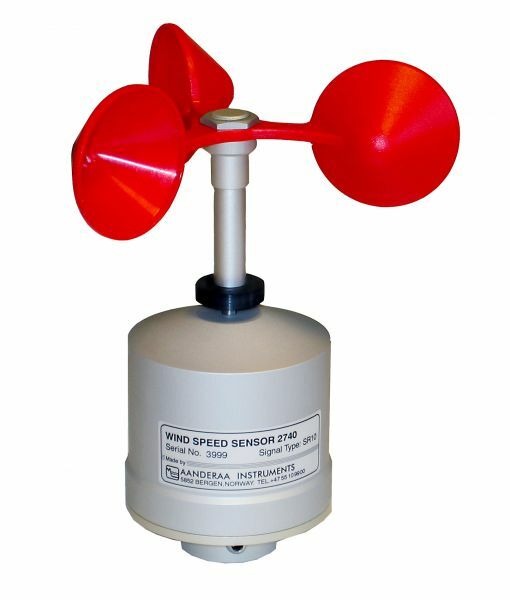 The sensor has two output signals; average wind speed and maximum wind speed (gust) during the sampling interval.